With RSessions Pin Up Girl Kit anyone is able to create runway ready chignons, ponytails, and voluminous hairstyles at home! The chic and trés portable kit includes the appropriate, hard to find pins, elastics, clips, styling brush, and the all important hair bun, in an easy-to-carry and easy-to-pack bag, along with a step by step instruction booklet. Available in brown, black and blond, and priced at $21.99, this is an item that you can’t afford not to own! Top New York based hairstylists and creators of RSession Tools, Kevin Ryan and Frank Rizzieri are no strangers to the catwalks and red carpets, working with top celebrities, designers and models for over 20 years. 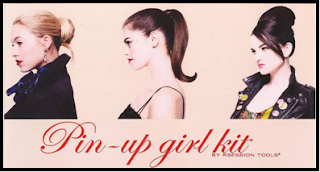 The RSessions Pin Up Girl Kit is the first product of the duo’s Runway Series which was created to give everyone their ‘secrets’ and the ability to create trendy styles on their own for a fraction of the cost of going to a salon. R Sessions Pin Up Girl Kit is $21.99. Available at www.RSessionTools.com, www.Rickys-nyc.com; Rizzieri Salons Ricky’s NYC Store Locations and East Coast Salon Services.